I'm up at 6am local time and feel well rested. I slept we'll on the flights over, which was great because it left me fresh to talk and spend time with people immediately after arriving in Budapest. I missed my connection in Paris after my flight from New York was 40 minutes late. I literally ran to the gate and was a sweaty mess, but arrived at 7:05 to a flight that was scheduled to leave at 7:15. I could see my plane at the end of the jetway, but they wouldn't let me on no matter how hard I protested. They put me on the next flight at 12:30, so I spent 5 very boring hours in Charles du Gaulle. Upon arriving in Budapest I was picked up by Ákos, an elder from the church and the man who took our family to the airport in March of 2012 when we moved from Hungary. Ákos took me to his home in Domoszló, where I was reunited with his wife Evelin and their daughter and with Ilona, one of the lay leaders from Golgota Eger. We ate and drank coffee and caught up for a few hours. They wanted to discuss how the week will go and how they think Jani and Tünde are doing. After leaving there, Ilona drove me into Eger, where we first picked up the church's car for me to use while I'm here, and then she took me to the guesthouse on Pacsirta utca that they are putting me up in; only 100 meters from where Nate went to óvoda (preschool). 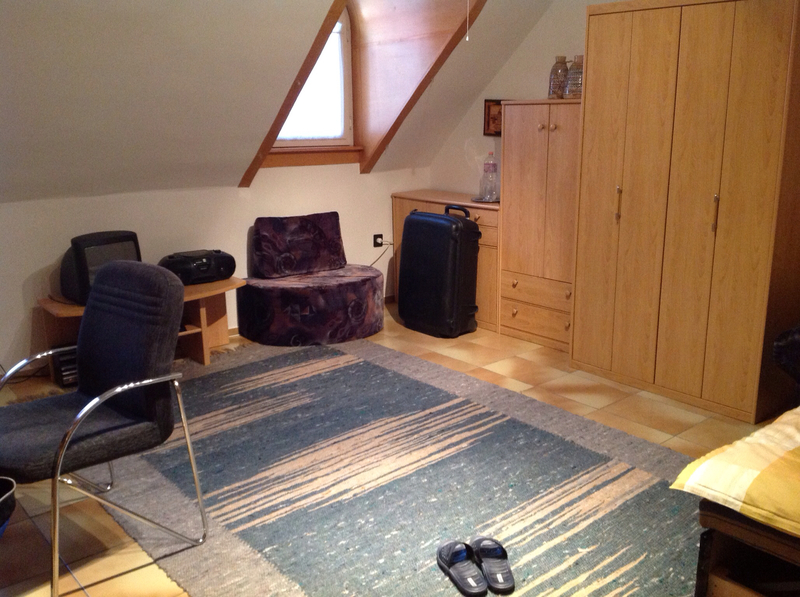 It is the finished attic of the home of a family who K. Judit from church teaches English to. It's very nice and clean; only bummer is that it seems they don't have wifi. One of their kids is headed over today to try to help with that. 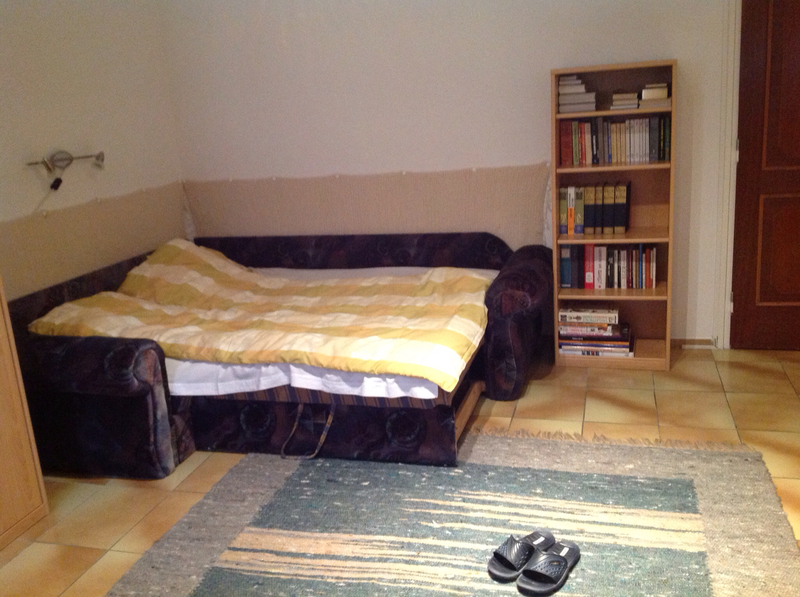 I took my stuff up to the apartment and then headed over to Jani and Tünde's flat for dinner. It was surreal driving around in Eger again, listening to Radió Eger in the car and seeing the old neighborhoods where we have so many memories. It is very wet here in Hungary; on the radio they were talking about how floods, and I could see that the ground is saturated with water. There are tons of potholes and standing water everywhere. But there is also that deep green on the hills and fields that I love so much. It was great to see the Hernádi's. Tünde cooked great Hungarian food - soup and túrós tészta. Afterwards they put their daughter Julcsi down to sleep and we spent about 3 hours catching up and talking about everything from the Heves church to White Fields to how they were doing and what happened with Misi. They asked me to officiate his funeral, which will be on Saturday at 11am at the cemetery which they can see from their balcony, looking towards Nagy Eged hegy. Can you believe that after 8 years of pastoring I have conducted so many wedding and baptisms that I can't keep track of them anymore, but I have never officiated a funeral. This will be my first. I plan to do it in Hungarian. Please pray for me to have God's words. I want to bring comfort and hope to the family, yet challenge those who are not believers with the Gospel message. Today it is raining outside. I plan to spend the day with Jani, planning the funeral and just being together. In the evening there is church, where I look forward to catching up with brothers and sisters from Golgota. It seems to me that this whole tragic event has brought them together in a powerful way. One of the many good fruits which can be seen from the people here walking by faith in dark, difficult times.